Guests line up for free snacks. The theatre is equipped with a new digital projector. The cinema also has a new screen. The balcony area remains mostly unchanged, except that the seats have been reupholstered. Chris McDonald, executive director of Hot Docs, addresses the crowd. Minister of Tourism, Culture, and Sport Michael Chan gives a speech. Hot Docs Executive Director Chris McDonald. Hot Docs Executive Director Chris McDonald and Minister of Tourism, Culture, and Sport Michael Chan. The night's screening was Big Boys Gone Bananas, a documentary about a documentary filmmaker who criticized Dole corporation (in a previous documentary, natch) only to have them come after him with all their legal and PR might. The night’s screening was Big Boys Gone Bananas, a documentary about a documentary filmmaker who criticized Dole corporation (in a previous documentary, natch) only to have them come after him with all their legal and PR might. MPP Michael Chan in the foreground, Neil Tabatznik, principal of the Blue Ice Group, in the foreground. Neil Tabatznik, principal of the Blue Ice Group, gives a speech. The underside of the cinema's renovated marquee. The underside of the cinema’s renovated marquee. 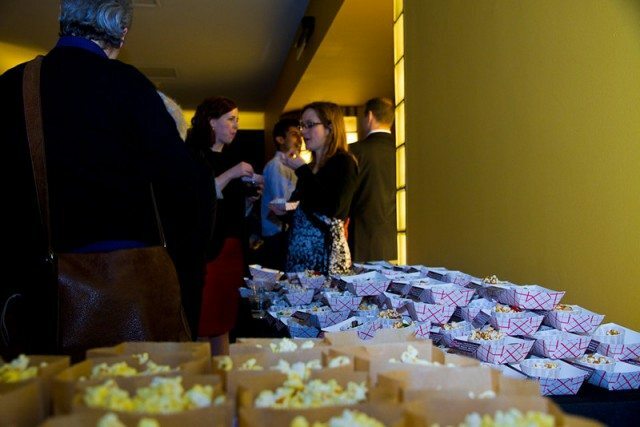 WHAT: The newly renovated Bloor Hot Docs Cinema held its grand reopening Wednesday night. A crowd of over 600 gathered to inspect changes made by the venue’s new owner, the Blue Ice Group, and to watch Big Boys Gone Bananas, a documentary about a documentarian who runs afoul of the Dole corporation. The night was the official start of the Bloor’s new life as a year-round home for Hot Docs, the annual documentary film festival. Today is the cinema’s first day of regular screenings.